Find artworks, auction results, sale prices and pictures of Albert Edelfelt at auctions worldwide. Albert Edelfelt (1854 - 1905) Lot 497: Albert Edelfelt, "Ung kvinna i grått" (Young woman in grey) Description: Painted in Paris around 1878. Oil on canvas laid down on panel 63 x 52 cm. Exhibited: Ateneum, Helsinki, "Realismi / Realismen", 1962, no. 44. Literature: Ord & Bild, 1935, p. 261; Bertel Hintze, "Albert Edelfelt, Del I, 1854-1888", 1942, mentioned p. 107 and illustrated full page, p. 105 (under the title "Ung dam i grått"); Bertel Hintze, "Albert Edelfelt, Del III, Oljemålningar, pasteller, akvareller, grafiska arbeten m.m. Beskrivande förteckning", 1942, listed p. 29, no. 106 (under the title "Ung dam i grått"). Provenance: Originally in the collections of Curator Torsten Waenerberg (as a gift directly from the artist); the collections of Consul Victor Hovings; the collections of Professor Werner Söderhjelm; the collections of Mrs Sigrid Söderhjelm, Helsinki (around 1942); Beijers Auktioner, Stockholm, Sale 14, "Beijers Klassiska Höstauktion", November 19 1986, lot 265 (illustrated full page in colour, Pl. 43, in the catalogue); private collection (acquired at the above mentioned sale); Bukowski Auktioner AB, Stockholm, Sale 562, "Vårens Klassiska", June 14 2011, lot 214; private collection (acquired at the above mentioned sale). Objektsbeskrivning ALBERT EDELFELT Finland 1854-1905 Vid fönstret Signerad och daterad A. Edelfelt Paris -84. Pastell på papper fäst på duk, 68 x 62 cm. Signed and dated. Pastel on paper supported on canvas. PROVENIENS Inköpt i oktober 1884 av Göteborgs konstförening därigenom utlottad till grosshandlare Henrik Jensen, Göteborg därefter i arv inom familjen därefter inköpt på auktion av en familjemedlem (Stockholms Auktionsverk, våren 2011, katalognr 2664) UTSTÄLLD Köpenhamn 1884 Göteborg 1884 LITTERATUR Bertel Hintze: Albert Edelfelt, Helsingfors 1942, del III, nr 277 i den beskrivande förteckningen, avbildad sidan 63 Införselmoms 12% tillkommer på klubbat belopp Import VAT 12% Albert Edelfelt - Finland's first cosmopolitan art icon Albert Edelfelt should be considered one of the leading figures from the Golden Age of Finnish art towards the end of the nineteenth century. He started his artistic career as a painter of historical events, but was subsequently responsible for launching French popular realism in his home country in the 1880s. Edelfelt enjoys a special position in the world of Finnish painting. Few other Nordic artists achieved such success on the international scene, and his paintings are still sought after and greatly admired by a broad audience today. Edelfelt was regularly commissioned to paint portraits, and his representations of the lives of everyday Finnish people play a fully justified role in Nordic art history. 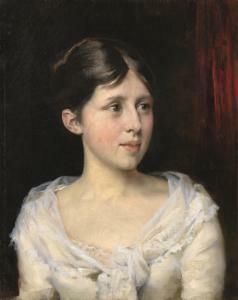 His works are often compared to the paintings of Anders Zorn - and the two actually became close friends. In the spring of 1884, it was ten years since Albert Edelfelt had first arrived in Paris. He had previously studied in Finland and Belgium, but it was now time to join the inner core of the Parisian art community. In 1877, his work Queen Blanca is unanimously accepted for exhibition at The Salon in Paris and this marks Edelfelt's artistic breakthrough. During the years that followed, Edelfelt travelled freely in Europe - cosmopolitan as he was - making repeated visits to Finland, Sweden, France, Russia and other countries. In spring 1884, his composition By the Sea was presented at The Salon and purchased by Pontus Fürstenberg, the great patron of the arts from Gothenburg. This was one of the highlights of Edelfelt's artistic career. His paintings from that year are distinguished by an inner equilibrium and artistic power in which the colouristic intensity becomes even more airy, with a clearer and more evident harmony between the colours. His pastel work At the window was painted during the early summer of that same year in Paris. The model Thérèse Lainville, a figure who appears in many paintings from that period, is captured in an on-the-spot work in Edelfelt's studio. Elegantly clothed in the latest fashion, she is ready to head out into the spring day, but is shown here sitting and waiting, looking out over the streets. Her pink hat and pale cheeks capture the first rays of the sun, which actively seek to penetrate the room via the window. With the quick and light touch of the open air artist, Edelfelt depicts his delightful model in an optimistically wonderful and airy composition. PROPERTY FROM A FRENCH PRIVATE COLLECTION Albert Edelfelt FINNISH GIRL IN A WHITE DRESS 1854 - 1905 signed and dated A. EDELFELT / 1883 centre right oil on canvas 41 by 33cm., 16 by 13in. We are grateful to Marina Catani for her assistance in cataloguing this work. Possibly, Mogens Andersen (1916-2003, Danish artist) Jacques Massol (1918-2007, Paris art dealer at 12 rue la Boëtie between 1957-82; acquired circa the mid-20th century, possibly from the above); thence by descent Probably, Bertel Hintze, Albert Edelfelt, Helsinki, 1942-44, vol. III: catalogue raisonné, no. 224 (as Porträtt av Mlle Foulc), or no. 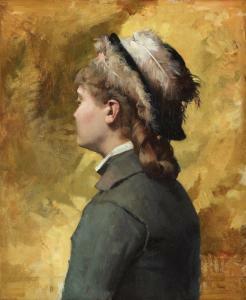 225 (as Porträtt av Mlle Bocher) Painted in the artist's Paris studio at 147 avenue de Villiers in 1883, the present work reveals Edelfelt as a successful portraitist. Depicted three-quarters, the young girl wears an elegant dress, painted by Edelfelt in a virtuoso, Whistler-esque 'symphony' of whites, her figure off-set against the red curtains. In this the composition particularly recalls the portrait of Edouard and Marie Louise Pailleron, painted two years earlier by Edelfelt's friend John Singer Sargent (fig. 1). The present work followed Edelfelt's commission two years earlier to paint the children of Tsar Alexander III of Russia, Michail and Xenia (private collection), at a time when Finland was a Grand Duchy of Russia. The Tsar's Danish-born wife Dagmar, renamed Maria Feodorovna, commissioned the portrait and was evidently pleased with the result, as she then invited Edelfelt to paint Under the Birches. Using his younger sisters Annie (16) and Berta (13), Edelfelt painted the two girls relaxing in the woods near his summer home in Haiko, near Porvoo in Finland. Exhibited to acclaim at the Galerie Georges Petit in December 1882, Edelfelt's success likely led directly to the request to paint the present work. A profusion of major portraits followed, including those of Louis Pasteur in 1885 (Musée d'Orsay, Paris), Finnish opera singer Aino Ackté in 1901 (Ateneum, Helsinki) and Tsar Nicholas II of Russia himself in 1896 (Helsinki University). Having honed his skills as a painter of historical subjects first at the Art Society in Helsinki and later in Antwerp, Edelfelt moved to Paris where he fell under the spell of the 'New Painting' - notably the plein air naturalism of Bastien-Lepage, and also of the Impressionists, who held their first group show the year of his arrival in 1874. From this point on, Edelfelt developed a new aesthetic, drawing on everyday subjects painted in a luminous, bravura palette, and culminating in his most impressionistic painting of all, In the Luxembourg Gardens, Paris (1887, Helsinki, Ateneum). The leading Finnish artist of the late 19th century, Edelfelt was the first of his compatriots to win a medal at the Paris Salon. The present work is likely to be one of the two portraits of young girls recorded in Hintze's catalogue raisonné (no. 224 or 225). In a letter to his mother on 10 May 1885, Edelfelt noted that Mlle Foulc, the sitter of the former work, had become a beautiful young lady, and the following year it was suggested that they should marry. "LADY ON THE BALCONY, LA PARISIENNE". Oil on canvas 72x59 cm. Literature: B. Hintze (1942), No. 280; M. Catani, "Albert Edelfeltin elämäkerta" (\‘Biography of Albert Edelfelt\’\’\’\’), Gummerus 2004, cover picture. Executed in Paris early spring 1884. In spring 1884, the Finnish painter Albert Edelfelt felt \“a scent of spring and life" wafting in through the vast windows and French balconies of his large corner studio in a modern studio house in northwest Paris. The neighbourhood around Parc Monceau was fashionable, with such celebrities living nearby as the artists Ernest Meissonier, John Singer Sargent and Bastien-Lepage , all of whom belonged to Edelfelt\’\’\’\’s circle of acquaintances. The studio consisted of two spaces with six-metre ceilings thrown together, and a bunk. The real novelty for Edelfelt was the outdoor painter's light that streamed in from the west as well as the north. 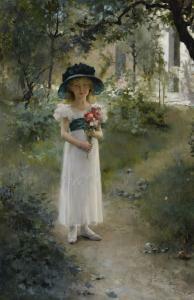 Previously, he had always worked in studios with cold northern light, which was suitable for academic figure painting. On a hot day, it might be impossible to paint in the studio which bathed in light and was hot as a greenhouse, and Edelfelt would open his French balcony doors and let in the spring air from the streets of Paris and the green hills at Neuilly. Ever since he first arrived in Paris exactly ten years earlier, Edelfelt had always loved the spring. He was seduced by the smells, but above all by the women of the bustling city in their beautiful summer dresses. Those of high society had their own carriages and never went alone in the streets. They visited exhibitions, cafes and department stores. 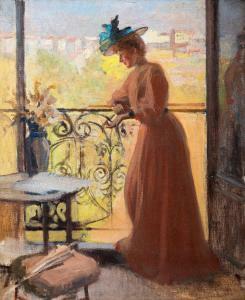 In this painting, Edelfelt reconnects to the impressionist theme of the urban balcony in the work of such painters as Berthe Morrisot, Gustave Caillebotte and Pierre-Auguste Renoir .